Do we know where our food comes from? Can we trust global profit driven companies when it comes to quality and sustainability? Does the food we eat have a positive or negative impact on the environment and community that produces it? Do we understand the logistics of getting the food to us and the carbon emissions that are harming our environment? Why is there so much food waste? And it can also lead us to believe, things are beyond our control, a feeling of a problem too big for us as individuals or as a community to deal with! However, that is a myth! In Scotland, we are on the right path and there are many positive choices to make. We can learn from the many success stories from across Europe and beyond, such as the inspirational and collaborative approach taken by the city of Bruges. Working together people and businesses have tackled food waste with benefits for their economy, their health and their environment. Next week Bute will be highlighted at a conference focussed on Local Authorities Developing Food Growing Strategies by working with communities. Discussions will take place around land use and planning considerations; partnership working with community groups and local authority interdepartmental working to overcome barriers. We will be sharing our experiences during 2018 Bute Carbon Free Food project. 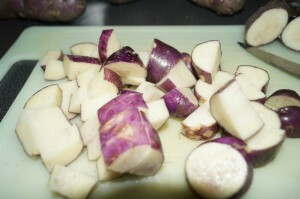 Bute Heritage Potatoes – Buy as local as you can! A great many people in our community are already making positive choices to help Scotland fight global warming, however sometimes it can be difficult to know where to start. Thankfully there are some easy and simple actions you can take to Eat Greener and Reduce Your Food Waste. 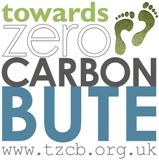 Join the volunteers of Incredible Edible Bute, to work together to grow and share carbon free food. Drop by the raised beds at Battery Place for autumn herbs and visit the Incredible Edible Accessible Community Garden at Chapelhill car park for winter vegetables – the kale is still going strong and it won’t be long until the beets and neeps are ready for harvest. We have incredible edible local bloggers too providing recipes for seasonal, local and low carbon food to try. Check out Sharon’s Bakes for an in season Cream of Mushroom Soup.